Tax season is hitting full-force here in the US! Our taxes have been done since early February, thanks to my own OCD record-keeping and our accountant’s desire to get us in and out as early as possible each year, what with our 80 streams of income and all that. But after a couple years of paying in some hefty figures around this time of year thanks to self-employment taxes and some other strangeness, this year, we are getting refunds from both state and local. Those checks hit my bank account this week, and as I share my financial update for this month, I thought it might be a good time to talk about tax refunds – and the best plans for them! As of this weekend, our total debt is down to $51,769.65 from its high of $89,686.23. That means we paid off $905.59 this month and $37,916.58 since early 2011! We’re now 42.28 percent debt-free – closing in on halfway there! While we didn’t hit any of our Very Next Step goals this month, I’m happy that even with our major changes in our financial situation over the past half-year, we’re making significant progress each month. You can always check out all of my progress and Very Next Steps in detail on my Joan’s finances page! So are tax refunds a good thing? In addition to my debt going down significantly this month, my savings and checking accounts went up! That’s due to some hefty side hustles and, of course, the aforementioned tax refunds. The thing is, I’m generally against giving anyone an interest-free loan. And, look, if you’re getting money back from the IRS or the state revenue department, that’s what you’ve done. But in this case, I’m more than OK with it. In fact, while things will be different later on, Chris and I decided last year that until we’re debt-free, we’re purposely going to err on the side of overpaying the IRS, because we just need the mental freedom of not having to worry about owing them anything! If you’re just not conscious of the amount you’re paying in, and you’re ROUTINELY getting a large refund, I encourage you to check out your withholdings and consider an adjustment. But if, like me, your income varies and you’ve been bitten in the past by a tax bill you had to scramble for, well, maybe let the government hang on to some of that cash earlier, and then take it back in March or April, yeah? So what if you ARE getting money back? It definitely can be good, but it can definitely get wasted, too. Over the weekend, I asked our Man Vs. Debt community on Facebook what their refund plans were. Linnea said, “A lot of our refund went to pay off debt and then we put away some to help pay for a future baby, which was good since we found out a few weeks later that we’re pregnant!” Congrats, Linnea, and GOOD planning! One of our most amazing You Vs. Debt grads, Katie, said she and her husband are splitting their refund and each using it to tackle their most hated debt. And Laura said she’s getting a much-needed new roof, while my buddy Jenna is going the new-windows route. All of these things sound awesome. In our case, we don’t have anything “spectacular” planned – no big hit against a single card, or anything like that. Instead, since we’d been paying just marginally over the minimums on all our debts for the past few months to avoid dipping into our savings while Chris transitions between jobs, we’ll likely try to get caught back up to where we expected to be at this time on the various accounts. So nothing will get a turbo-kick, but at the same time, I’ll feel better about where we are! The problem, of course, is when you don’t have a plan. When the $500 or $5,000 you get back at tax time just goes into the checking account and somehow… vanishes, in a steady stream of $50 dinners out or $100 trips to the mall? That’s what I rail against at this time every year. My stream of friends does not exactly look like the Man Vs. Debt community – it’s full of good people who are in a good bit of debt taking thousands of dollars and turning it into designer sneakers and big vacations. And I’m not judging that, because I’ve been there – and because I’m a BIG fan of having a bit of fun, too, as a way to stay motivated for the long haul. In our case, I got a new messenger bag, which I’d been eyeing for a while, and Chris and I took an evening and $60 and headed to our local casino for a buffet dinner and some penny slots. The difference, again, is that we had a plan. Not everything we wanted to splurge on, but a few things. Some money set aside for expenses we know are coming and want to have a buffer against. And then, back to tackling the credit cards. 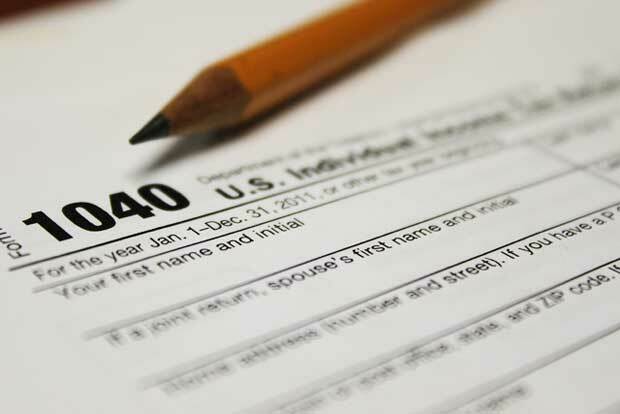 So what are you doing with any tax refund you might be getting this year? Or, if you’re not caught up in the wonder of the US tax system, what about any other “windfall” or large sums of money – what do you do with them? I honestly don’t know how much of an refund I’ll be getting this year– I’ve been living of a $240/month stipend while serving in AmeriCorps. If I get a refund, it’ll probably all go to my credit card– only $835, which isn’t as scary as it could be, but $0 is always better! My State and Federal returns hit my bank account late last week – less than a week after I filed them. Amazing. Anyway, they are going toward paying off my third of four credit card bills. That means by the end of this week I will have ONE credit card bill!!! I’m so thrilled. Sounds like you guys are making great strides this year. We will pay off our car, and part of our heloc. We plan to retire $27,000 in debt this year not counting our rental properties. The refund will push us a long way towards that goal. I agree with your point on the tax free loan. We aim to change that soon, but for now it is gratifying to knock a huge chunk off a debt. In our case we will save a $264/mo required car payment. Its all about net cash flow for retirement. I’ll be paying in this year. I had a side hustle that ended up costing me more than it made – but oh well, lesson learned! With what banks are paying intrest these days, I don’t think it is such a bad idea to let the government hold it for you. It sure is great to get a big check back. Hi Joan, I like that you allow yourself a tiny splurge; we also do this, usually around 1 or 2 percent, depending on how much we get back. I’ll be finished with graduate school in June and my family will be using our tax refund to supplement our income while I look for a new job; by using our tax refund, we can keep our emergency fund in tact. If I find a job quickly, we’ll put our refund toward paying off one of our credit cards– yahoo! I haven’t quite finished my taxes and I haven’t decided for sure what I will do with the refund. We don’t have state and local taxes here, but it looks like I’ll get around $1000 in refund from Uncle Sam. This is a huge transition year for me – I am finally cutting all ties with the BIG BANK I used to work for. Finished all disability leaves, finished my severance, and by next month will be off their COBRA and on my own. I’m working hard to make my various streams of income large enough to support me, but I really have no idea what my income will total up to by the end of the year. I’m actually leaning towards either putting the money aside in a “New Car” fund, or else I might just let Uncle Sam hold on to my refund. I am debt-free, and the interest rates are practically non-existant – so I might leave the money as a ‘down-payment’ on next year’s income, and thus not really concern myself with making any quarterly payments on my self-employment for 2014. I am hoping that I will actually owe some money at the end of this year – not that I want to owe money to the IRS, but hoping that I will earn enough that I will actually need to pay some taxes this year. Timely post, Joan, I have done my taxes but haven’t gotten my refund, yet. Like you, we sometimes have to pay, so I was grateful for a refund this year (though I planned to have to pay). Since we are nearing retirement (though we still have debt, but it’s on its own payoff schedule) we decided to put money into our IRA, which helped to increase the amont of the refund, yeah, by $200. Can’t beat that, free money! Again, thanks for all the motivation!! We’ve already received our substantial refund from IRS for 2013 and invested it in a five-year CD here in Costa Rica at an annual rate of 12.60%. This CD and others we’ve bought in the past year are our emergency fund. Yea to almost $1,000 paid towards your debt this month! Way to go. I’m getting around $700 back from the IRS this year and I’m going to spend it on a road trip with my mother this fall. I’ve spent the past year building up a decent savings after paying off my debt, and I’m trying to find that balance between saving and spending. When I was in debt, there was no option to spend. When I was building up my savings, there was no option to spend. Now that I have the option I’m struggling to actually let go of the money. It’s a balancing act, that’s for sure! But I’m choosing to spend the IRS money guilt free, especially since it’s going to a great life experience with someone I love. Thanks for all that you share on this blog! It motivates both those making their way out of the red and those making their way further into the black. I love checking in with your progress each month. God bless! We usually end up owning just a little bit or with a small refund. This year we about about fifteen hundred. We were on vacation in Las Vegas and the deposit came in. We used some of it to splurge. It was timely and contributed to a much needed vacation. We are totally debt free (including our home) and did not use credit cards or any debt for the vacation. So it was a blast and extra treat for us this year!